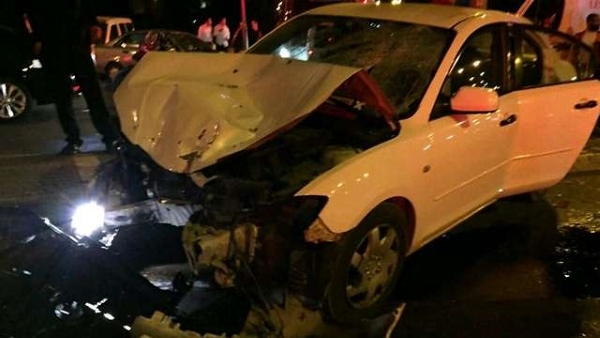 On April 15, Khaled Koutineh, a resident of eastern Jerusalem who was angry about having been delayed at a checkpoint drove his car into a bus stop, killing Shalom Yohai Sherki, 25, and seriously injuring Shira Klein, a young woman. Yesterday there was another vehicular attack, in which four police officers were injured, one ‘moderately’. There were also two separate incidents on the same day in which Jews were attacked by knife-wielding Arabs. There have been at least 5 vehicular attacks on Jews by Arabs since November 2014, and numerous knife and meat-cleaver attacks. Every single day, Jewish cars are bombarded with rocks and firebombs, sometimes resulting in death. Sure, they are always angry and “frustrated,” but there is a deeper ideological reason for what they do. I want to rerun an article I wrote last year, after a particularly horrible firebombing, and add something to it. You probably heard about the 11-year old girl who was critically burned on Thursday when the car she was riding in was struck by a firebomb thrown by an Arab terrorist. And you certainly know about the attack on the Kehilat Bnei Torah synagogue in Jerusalem in which four worshipers and a policeman were brutally murdered. You probably know about the several incidents in which Arabs drove their vehicles into groups of Jews, including one in which a 3-month old baby and a tourist from Ecuador were murdered, and another in which the driver got out and ran back to his not-yet-dead victim and cut her throat. If you follow these things, you may also know that Jews are afraid to go to the historic Mount of Olives Cemetery in Jerusalem because of continued violent attacks on buses, cars and people. You may also have heard about the daily rock-throwing attacks on the light rail in Jerusalem, against Jewish-driven cars on the roads in Judea and Samaria, the acid thrown on a Jewish family, etc. I could go on. And on. The horror of the 1903 Kishinev pogrom was a turning point for many Jews, including Ze’ev Jabotinsky. Jew-hatred was finally seen to be implacable and a permanent feature of Diaspora life, and only a complete separation from the haters by the establishment of a Jewish state and the relocation of the Jewish people to it could be a permanent solution. I think the firebomb incident was my own personal Kishinev experience. Now there is a Jewish state, but the problem of hatred-spawned violence against Jews has not ended, even here. There is a simple reason for that: we allow it. The Palestinian Arab leadership and its official media as well as their legions of social media propagandists incite murder every day. They pay the salaries of incarcerated murderers, treat released terrorists as heroes, and call for violent action against Jews, sometimes in remarkably ugly ways. We don’t stop them. We could, but we don’t. We could stop the terror on the roads of Judea and Samaria. When an Arab village harbors terrorists, we could destroy it. But because we are afraid of being accused of ‘collective punishment’ by the less-than-objective UN, EU and Obama Administration, we don’t. We don’t believe that Arab populations can be forced to move when they breed and support terrorism. We take seriously the idea of removing Jews from their homes — and do it, in Gush Katif and Amona — but expelling an Arab would be a violation of his human rights, another nakba. We talk about destroying the homes of terrorists, but rarely do it. We don’t have a death penalty for terrorist murder. Instead, we keep the murderers in jail until their supporters kidnap a Jew, and then we ransom the Jew by releasing them, sometimes in a ratio of 1027 terrorists to one Jew. The terrorists go home to a victory parade and then go back to trying to kill Jews. The Zionist imperative is to preserve the Jewish state in order to preserve the Jewish people. That is our highest priority — not to try to live up to the hypocritical and cynical double standards set by people in Brussels or Washington who would just as soon see the Jewish people gone anyway. We need to change the way we are fighting the long war that we are in, because today we are losing. We are losing Judea and Samaria, we are losing eastern Jerusalem, and we are losing the Galilee and the Negev. Soon it will be impossible for a Jew to drive even in Kfar Saba without an armored vehicle. And after that? The solution is not to talk to them about ‘peace’. They have given us their answer with their firebombs and meat cleavers, their cars and their knives, as well as their words. How many times do they have to show us their intentions before we get it? Do we, civilized people, understand what it means to be in a struggle with barbarians? Do we understand that the choices are victory or the end of our state, death and dispersal? But we seem to care more about Arab rights than our own right to exist. We are at a turning point. We need to choose between victory and destruction. There are no other alternatives. Khaled Koutineh may have been angry about the checkpoint, but the deeper motive for his attack, like all Arab terrorism here, is to make life so bad for us that (they think) we will give up, get up and leave the country. Very little has changed in recent months. We had an election, but I didn’t hear any of the candidates talking about how the Arabs are trying to drive us out of our land (and if one had, he would probably have been banned as a Kahanist). The way to respond to terrorism is not to become “more democratic” (i.e., to give more power to Arab citizens) or to make concessions to the PLO/PA. It is to move in the other direction: to emphasize the Jewish nature of the state, and to strengthen our hold on the territories. Rather than encourage the Arabs, we need to make them lose all hope of throwing us out. We must make them understand that if they want to live in the land of Israel, then they must accept Jewish sovereignty (and if not, there are 22 Arab countries, Europe and the US). For this reason, I hope the new government will pass a “Jewish State law“. The history of nation-building — of human nation building — is this: we are in America. What happened? There were some Indians. Then some white people came and they killed the Indians, and they took over. That’s what happens with countries. If I get your territory, if I win a war, I either kill you, I subjugate you, or I expel you. In rare cases I would make you citizens, on my terms. That’s the way the world works. The Jews were survivors of [the] Holocaust and of pogroms, and did not have a state for 2000 years. So they can re-invent the wheel. ’67 war? They decided not to annex, and not to kill the people. Not to expel them, but to do some kind of — God knows what it is — a very complicated Talmudic thing, nobody knows, even the Jews cannot figure it out. This is not the way to do it. You want to be nice? And you think you can build a state like this? I’m sorry. Go somewhere else. This is the reality, this is how it works. This is how it works. The Arabs understand it. Why don’t we? This entry was posted in Jew Hatred, Terrorism. Bookmark the permalink. Now that there is clearly not going to be a two-state solution (Perhaps forever) we are faced with the reality of having an Arab minority of forty percent or more within our borders. The political status of those in Yehuda and Shomron is different from those who are Israeli citizens. Should we annex everything one- sidedly and make these Arabs citizens we would destroy the Jewish character of the state. It may not be nice to say, but it is already problematic enough with the large Arab minority the state already has. I do not know the answer. Certainly the end of apology for sins we have not committed is correct. Surely emphasizing the Zionist character of the state is essential and educating to a stronger kind of patriotism. Perhaps Naftali Bennett as Education Minister will be successful in this. But I do not believe that the end to Arab hatred and will to destroy us will come for a long time. And even if it should come the size of the minority, the difference in character, culture and above all political purpose and identity makes this an almost impossible problem for us. What is the answer? I do not know. Perhaps some kind of plan in which we give autonomy to the most heavily populated parts of Judea and Samaria. But still we would have to control any military activity in that area. As it is what is remarkable is that Israel is doing so well, prospering in so many areas despite this difficult situation. The imperfection and problematic character of our political reality is going to be with us for a long time to come.